In 1948, Shannon was an American mathematician, Electronic engineer and Weaver was an American scientist both of them join together to write an article in “Bell System Technical Journal” called “A Mathematical Theory of Communication” and also called as “Shannon-Weaver model of communication”. This model is specially designed to develop the effective communication between sender and receiver. Also they find factors which affecting the communication process called “Noise”. At first the model was developed to improve the Technical communication. Later it’s widely applied in the field of Communication. The model deals with various concepts like Information source, transmitter, Noise, channel, message, receiver, channel, information destination, encode and decode. Thomson made call to his assistant “come here I want to see you”. During his call, noise appeared (transmission error) and his assistant received “I want” only. Again Assistant asked Thomson (feedback) “what do you want Thomson”. Due to transmission error or noise, Assistant can’t able to understand Thomson’s messages. *The noise which affect the communication flow between them. What are the three levels in Shannon and weaverz mode? What problems are dealt with at each and every level ? There can’t be a better definition. Excellent. a good explanation,,,simple and clear to the point,,,Regards. really so impressed about well explained model with short and precise notes which understandable. i got more infermation,,,,good explanation ………….. I NEED FURTHER EXPLAINATION AND MORE INFORMATION. Using at least two models of communication .Explain how and why the teacher should communicate. thank you very much for the information. however as students we need more . not only do we need the criticism part but also more of how useful this model and real life examples of this era. 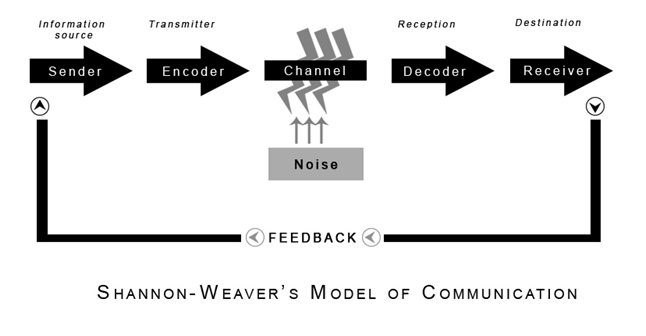 Very confused as I read Linear model of communication,where I read that there is no concept of feedback,and related the Shannon n Weaver’s.Here feedback is concepted.So,I’m realy Confused. There is no feedback in the Shannon and Weaver model (1949). You are discussing the wrong model as far as communications as a subject is concerned. Thank you so much for this…it helps a lot. Thank you. @ my view and understanding is excellent.